It’s no secret that I love Halloween. Pumpkins are a particular favorite. I found this quilted wall hanging project by Patrick Lose in a Fons & Porter publication called Quilting Celebrations, Winter 2010 edition. I made a few tiny changes to the original pattern. I decided to use raw-edge applique with black thread rather than the heavier satin stitch suggested in the pattern. I also added a button to the eye. I can’t wait to hang it up! I’d never heard of Patrick Lose before, but I’ll definitely be checking out his work now. 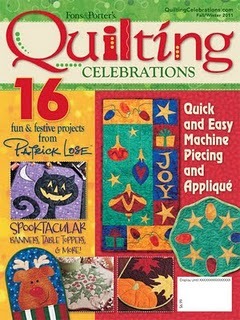 There is a new issue of Quilting Celebrations coming out on 9/27 – I can already tell this one will have some great projects, too. Check out the cover – I love that black cat! So, please educate me, as I’ve obviously been living under a rock. Have you done any Patrick Lose projects? If so, please leave a comment, with a link if you can, so I can find more!